I read this article and found it very interesting, thought it might be something for you. The article is called Using Quora For Content Creation Ideas and is located at https://www.ben-johnston.co.uk/using-quora-for-content-creation-ideas/. Quora, the question and answer platform for grown-ups, is one of my favourite sites. It’s an amazing learning resource if you follow some topics that you’re not overly familiar with and it’s a great place to share your knowledge with other people too. I use it a lot and have plenty of fun doing it, even if much of my time on there is spent facepalm-ing at the amount of people that still ask about article marketing, keyword density and such forth. There’s another side to it though, and that’s what I’m going to talk about today – it’s one of the best content-idea generators out there. If you’re creating that “great content” that we’re always banging on about in this industry, it’s got to actually do something – it’s got to fulfil a need of some description, whether that need is informing people, reassuring them about something or just proving relevant to their interests, it’s got to have something people want. Put simply, it’s got to answer a question. That’s where Quora can help. Yes, it’s a place that people ask that question and get an answer, but that’s the point. Your audience is asking these questions – wouldn’t you rather they found your beautifully-created piece of content that answers it than went on a Q&A site and found it there? Added to that, wouldn’t you like to see your link as a reference there? 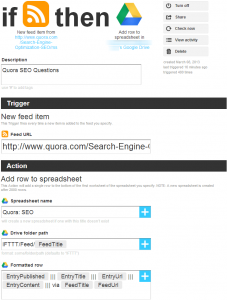 Most links on Quora are no-followed, but it’s a great source of referral traffic. Here’s how to find the ones worth building a piece around. The question is fairly unique but really interesting and there is a lot of engagement around it, a lot of answers, it’s been promoted and shared a few times. This method will help you find them both, quickly, easily and for free. Optional extras are a keyword research tool – I recommend Market Samurai (aff), but SEMRush (aff) can also be very valuable and a scraper of some description may be helpful too. Keep you eyes peeled for a future series of posts detailing a load of my favourite white hat scraping methods. 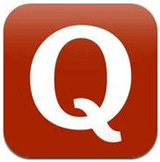 Each topic on Quora gets its own RSS feed, making finding your questions really easy. You don’t have to be sat on it all day with a notepad or anything like that, you can just set it and forget it. Identify your target section (for this example, we’ll use SEO). You might need to stay top-level of your industry for some topics rather than drilling into subcategories, just to make sure you’re getting a decent amount of data. Now grab the RSS feed URL. They are always http://www.quora.com/YOUR-TOPIC/rss, but make sure you’ve checked that the topic exists on there first. You can do that with a simple search. Go to IFTTT and set up the RSS to Google Docs recipe and accept sharing. 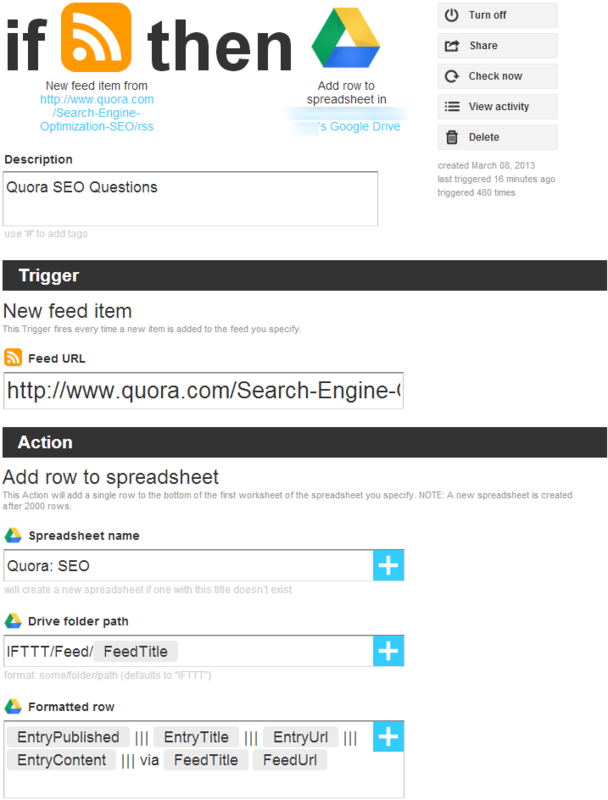 For the SEO example, you can use this IFTTT recipe or you can follow the instructions in the image (click to enlarge). It’s really that simple. You’ll now find any questions asked in that topic going straight to a Google Docs spreadsheet. There are literally thousands of things that you can do with this information. Personally, I like to leave it running and take a look every week or so. If there’s not much in those spreadsheets, I reevaluate the topic choice, but most clients have a few areas that you can look at. Once I find a few questions that pique my interest or that have come up a few times, I start looking into ways that we can create something for our client that answers that question. This can take many forms and, ultimately, it’ll be down to you and your processes. Personally, I like to take a few, pull the assumed keywords around that question, run it through search suggest and see what comes out. Then I run a few searches to see if we’re treading old ground. After that, it goes through the keyword research process, just to see what we can get out of it. I hate doing it that way, but 99% of the time, it’s the only way to get anything resembling client buy-in. Once that case is pulled together and the client’s given us what we need, we get to work on the piece the way we would anything else. There’s so much that can be done with this that I haven’t even scratched the surface, but it’s one of the ways that we can debunk the “my industry’s too boring for a content strategy” myth. At some level, pretty much everything’s got an audience and they’re always asking questions. The question you have to ask is – are you listening? Any other ideas around this? See you in the comments.